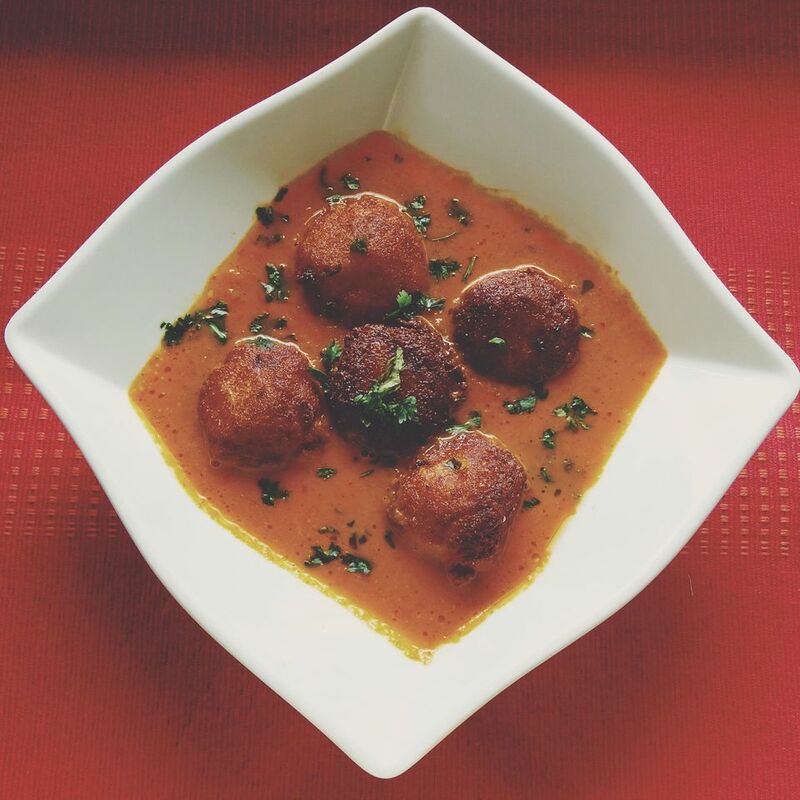 In Mukhmali Kofta curry, melt-in-your-mouth, silky (Mukhmali) cheese balls are submerged in a thick Indian gravy! They are a treat to eat. Serve them with Naans, Parathas or Jeera Rice. This recipe makes 32 cheese balls. Put the grated cheddar cheese in a large mixing bowl and mash with the back of a fork. Add the pepper powder and then the cornflour a little at a time. Knead to get a smooth, medium-firm dough. When you have rolled out all the dough into balls or while you are doing this, heat the cooking oil for deep frying, on medium heat till really hot. When the balls are ready, add them, a few at a time, to the hot oil and fry till golden, making sure to turn them often so they don't burn. After frying, remove them with a slotted spoon and drain on paper towels. Keep aside for later use. Put the quartered onion, tomatoes, green chillies, ginger and garlic and all the powdered spices (except garam masala) into a food processor and grind into a smooth paste. There is no need to add any water to this while grinding as the juices from the tomatoes will provide sufficient liquid. Heat the cooking oil in a deep pan on medium heat, add the above mixture. Stir and fry till the oil begins to separate from the masala. Stir often to prevent the masala from sticking and/ or burning. Add the thick cream and stir gently to blend completely. The finished gravy should be the consistency of a thick soup. Garnish with chopped fresh coriander and serve with freshly prepared Naan, Paratha or Jeera Rice.